Synopsis taken from the dust jacket: From international bestselling author Syrie James comes a haunting and deeply romantic story of forbidden love that will steal your heart and never let go. When Nichole Whitcomb's car runs off a Colorado mountain road during a blinding snowstorm, she is saved from death by a handsome, fascinating, and enigmatic stranger. Snowbound with him for days in his beautiful home high in the Rockies, she finds herself powerfully attracted to him. But there are things about him that mystify her, filling her with apprehension. Who is Michael Tyler? Why does he live alone in such a secluded spot and guard his private life so carefully? What secret - or secrets - is he hiding? Nicole has secrets of her own and a past she is running from - but Michael understands her better than anyone she has ever known. Soon, she is falling as deeply in love with him as he is with her - a profoundly meaningful experience that is destined to change their lives forever. If you've read my blog before, you'll know that I have an odd system for choosing books. I usually go into the library with a list, but almost always pick one or two books at random, without even reading the dust jacket. If the title or cover appeal to me, I'll just grab them and go. I've discovered some of my favorite authors that way, so as odd as it sounds, it works for me. 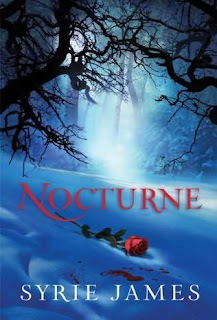 Nocturne was one such choice - I saw it, was intrigued by the cover art, and figured by both it and the title that it had something to do with vampires. Ms James obviously put a lot of thought into the characters. Since there are literally only two characters in the book, she pretty much had to, or the entire story would have failed. Nicole and Michael have interesting, thorough backgrounds, traumas in their pasts that haunt them, and that they help each other acknowledge, learn from, and get over. They share a love of literature and music, two things I can relate to, and which I always appreciate in characters. At first, the story reminded me of Beauty and the Beast. Nicole was trapped there with Michael, and in the beginning, because Michael wasn't really interested in having a house guest that was forced on him while he had this big secret to hide, he acted like a beast - rude and unfriendly, ordering her to stay out of his study and telling her he liked to eat alone - but when he realizes she's more than just a pretty face and they share a lot in common, he warms up to her. There's always sexual tension between them, but the entire dynamic between them changes when Nicole discovers Michael's secret and he no longer has to hide his true nature. This might seem really picky to some people unless you're either a writer or an editor - I'm both, so either bear with me while I'm in editor mode, or feel free to skip this part. The author does a lot of telling rather than showing - 'she did this, then she did this, then she did this'. There are places where she paints a fairly vivid picture of what's happening, but she's not really consistent. She also often uses their names instead of 'he' or 'she' - there are only two characters in the book, we know who she's talking about without her telling us five times in one sentence that it's Nicole who's thinking or speaking. Odd little things like that interrupted the flow for me and made it harder to read. Another thing that bothered me is for the first half of the book, she's always internally asking herself questions. Who was he? What was he thinking? What was she doing? How did she know this? How did she do that? It got kind of annoying, especially because she almost always answered her own question immediately. The author even does this in the dust jacket synopsis: Who is Michael Tyler? Why does he live alone in such a secluded spot and guard his private life so carefully? What secret - or secrets - is he hiding? That's what a lot of the book is like. Also, I'm a big fan of romance novels - romance is one of my favorite genres, but this book at times was romantic to the point of being cheesy. I realize that characters in books usually have a small window to fall in love and live out their love story, but in the span of a day or two, she went from thinking he was a jerk to falling madly and deeply in love with him, 'loving him with her whole heart' and wanting to be with him forever. It's sweet, but at times I had to roll my eyes. And that's saying a lot coming from me, because I don't normally mind a bit of corny/cheesy behaviour or language in a love story. Because the book had only two characters and one setting, there's really only so much story, so she goes fairly in depth into Michael's hobbies - he's a horseman, makes music boxes, and has a greenhouse. The information is interesting, but if you have no interest in these things, it can kind of take away from the story because she goes into great detail. Overall, this book was pretty good. Not spectacular, but good enough that I'm interested in reading some of her other books. Actually, all of her book titles sound interesting, but then again, so did Nocturne. I would recommend it if you enjoy love stories having to do with vampires, and if you like over-the-top romances. I like your method of choosing quite a bit. I too have found some of my favorite books quite by accident because their covers jumped out at me at a bookstore or library. And, I think it's always good for us all to read books that are out of our comfort zone or reading habits.